Welcome to Run Across the USA.com, the home of Matt Wyble and Brandon Newlin's transcontinental trek from Atlantic City, NJ to just south of Portland, OR. The 3,248 mile journey began May 24th, and ended August 27th in Lincoln City, OR. Visit our About the Run page to learn more! 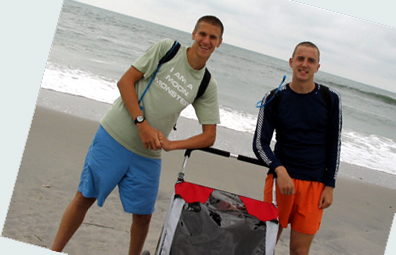 On August 27 Matt and Brandon ended their run at Road's End Park near Lincoln City, OR. They are now turning their attention towards writing a book about their adventures and continuing their fundraising efforts for clean water in Africa! Want more Matt & Brandon? Visit the Archives section to search through all our posts! Interested in showing your support with a Run Across The USA t-shirt? Check out what we have for sale in the Store! You can help out Matt and Brandon during The Run! If you want to learn more about how you can, check out our Want to Help? section. Click here to learn how you can donate money to Matt and Brandon to help them pay for some of the expense of The Run. You can even donate online!